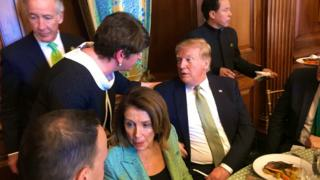 Arlene Foster met US President Donald Trump at a St Patrick's Day celebrations lunch in Washington on Thursday. The lunch was hosted by House of Representatives Speaker Nancy Pelosi. Taoiseach Leo Varadkar, US vice president Mike Pence and other high-profile political figures were also in attendance. Mrs Foster has said she hopes to invite Mr Trump to attend the Open Championship at Portrush this July. She told BBC News NI that she would "very much" like to se the US president visit Northern Ireland. It is not the first time a visit by President Trump to Northern Ireland has been suggested by a DUP politician. DUP MP Ian Paisley said he invited the president while on a visit to Washington for St Patrick's Day in 2017. Mr Trump has said he will be visiting the Republic of Ireland at some point this year. During a press conference with the taoiseach, the US president confirmed he would make the trip because Ireland is "a special place". He added that he and Mr Varadkar have become "fast friends". Mr Trump was due to visit the Republic of Ireland last year, but it was cancelled for "scheduling reasons".